Keith and Mary are full time residents on Lake Harding and are the Lake Harding pros! They have helped many families purchase their dream home or that perfect weekend getaway. Keith and Mary are known as the “spouses selling houses” who are rated #1 by an independent lab! 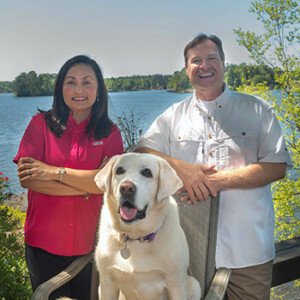 If you are looking for a home on Lake Harding, Keith and Mary can help! They work with the multiple listing service and can show you any home on the lake. Keith and Mary also show Lake Harding by boat to get a true feel of the lake and where you are situated on Lake Harding! So if you are considering a Lake Harding home, contact the Lake Harding pros! Get in touch with Keith and Mary Williams and find out why they’ve been rated #1 by an Independent Lab over and over again!